Today, we’re excited to announce Opera Max, a free and easy-to-use app that can save you data on your limited data plan by compressing video, images and text used by your device. 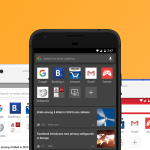 This means that you can use your favorite apps, browse your favorite sites and use less data while doing both. Our goal is to give you more for the money you spend on your data plan. 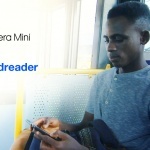 How does Opera Max work? 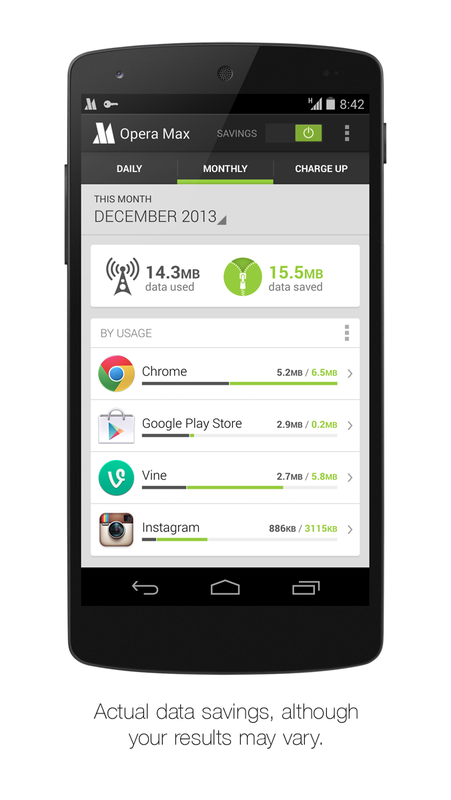 Opera Max uses a Virtual Private Network, or VPN, to measure all the data usage on your phone. Once Opera Max savings is enabled, all non encrypted data requests are sent through our compression servers that optimize video, images, and websites to use less data. We only measure how much data you use and how much data you’ve saved. How much can I save with Opera Max? That depends on the applications you use, the kind of media content you access and of course how much data you use. We only provide savings for HTTP non-encrypted data usage. Opera Max will not save you data on applications that use HTTPS encrypted or other protocols, like User Datagram Protocol. In normal English this means that you won’t save data on encrypted apps, which includes some top apps like Facebook, but you will save data on the majority of apps and any content that is not encrypted. Right now, we’re looking for beta testers in the US on Android version 4.0, often called Ice Cream Sandwich, and later. We want to test our servers and see how you like the app. If you want more control overhow much data you use and if you’re curious about which apps are hogging your data plan, then you’re the tester we want. We are inviting you to join our beta tester program. Capacity is limited. The beta is currently restricted to Android users living in the US. Opera Max won’t work if you’re outside the United States; but, don’t worry, we’re working on expanding to other platforms and countries soon. How do I join the beta test? 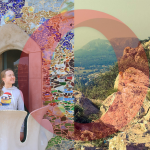 1) Join the Opera Google+ Community. Note: You need a Google+ account to join our group. You can create one here if you don’t have one yet. 2) Opt in for the beta test here. 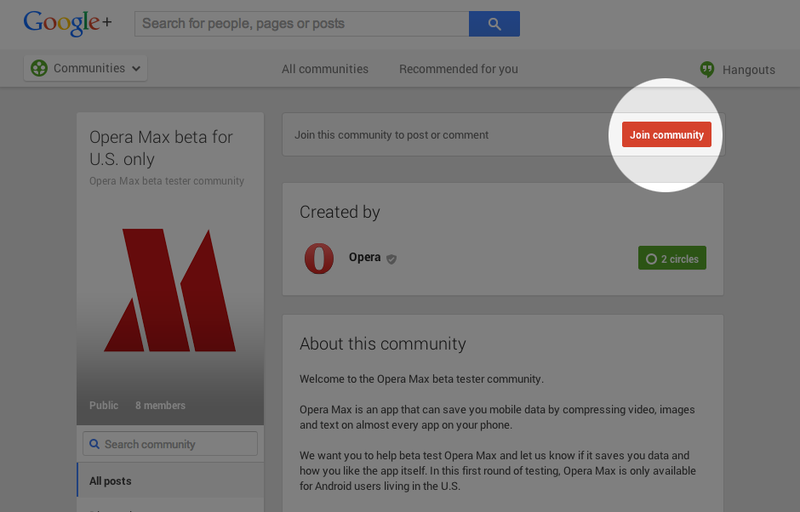 You will find all the necessary links in the Opera Max Google+ Community page description. 3) Download the app from Google Play and agree to the End User License Agreement. We’re working hard to make the best data savings app for your phone. We look forward to hearing your feedback! 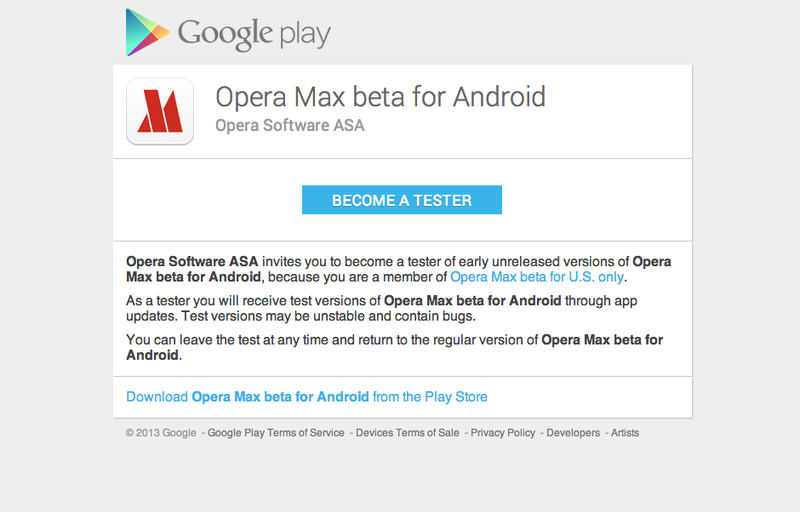 UPDATE: You don’t need to join the community group to download Opera Max. Read more here.